Our inaugural Brass Festival is a three-day event featuring multiple guest artists, LU brass faculty, music students and various sponsors and exhibitors. Each day will include a variety of performances, master classes, clinics and exhibits that are open to the public. As the only music event of its kind in Southeast Texas, the festival will reach a wide audience ranging from students, educators and brass-music enthusiasts to the general concert-going public. Our purpose is to educate, inspire and entertain those in attendance by bringing world-renowned artists into our community to perform alongside our faculty and students. Festival admission is $20. More details. The City of Beaumont’s Jazz at the Lake series kicks off this month headlined by Lamar University's Cardinal Jazz Orchestra and the Jimmy Simmons Quintet on Thursday, March 24, 2016 at 5:30 p.m. Held at the Event Centre, this concert is free and open to the public. Lamar University’s Concert Band will appear in concert at 7:30 p.m., Thursday, March 3, in the University Theatre. The Concert Band will be joined by the Honors Brass Quintet and piano soloist T.J. Senters of Beaumont, a student in the Texas Academy of Leadership in the Humanities at LU. The program includes selections from Gustav Holst, Arturo Marquez, Béla Bartók and many more. Admission is free. The Mary Morgan Moore Department of Music at Lamar University will present a guest artist concert featuring the jazz duo of pianist Joe LoCascio and saxophonist Woody Witt. The performance will be in the Rothwell Recital Hall on Wednesday, Feb. 17, at 7:30 p.m. LoCascio and Witt will perform music from their latest CD, “Absinthe: The Music of Billy Strayhorn.” Admission is free. Lamar University’s Cardinal Jazz Orchestra will perform classic and contemporary big band music and fresh arrangements of holiday classics with the Port Neches-Groves High School Jazz Band on Tuesday, Dec. 1, 2015. The free concert begins at 7 p.m. in the Port-Neches Groves High School auditorium. From Pentatonix to B.B. King, Lamar University’s Cardinal Jazz Singers Cardinal Jazz Singers’ concert on Nov. 19 will feature a variety of classic jazz standards and Christmas music, as well as contemporary selections, all performed a cappella or with a live student rhythm section. The free concert starts at 7:30 p.m. in the Rothwell Recital Hall. Directed by Rebecca Windham, instructor of voice in the Mary Morgan Moore Department of Music, the Cardinal Jazz Singers ensemble provides students a dynamic musical experience that takes them from the classroom to the stage. The Lamar Civic Orchestra’s fall concert on Tuesday, Nov. 17, will feature works by Schubert, Bernstein, Vaughan Williams and Mozart. The free performance will be at 7:30 p.m. in the University Theatre. Lamar University's Drumline and Percussion Ensemble both took first place at the annual Percussive Arts Society's International Competition, Nov. 11 - 14, 2015, in San Antonio. Winning first place at the Percussive Arts Society is among the highest honors a collegiate percussion ensemble can receive. The awards establish LU’s percussion program as one of the finest in the world. 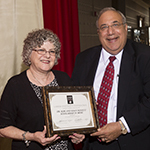 The Lamar University Foundation has established a new scholarship in honor of Russ Schultz, recently retired dean of the College of Fine Arts and Communication, and his wife Susan. Endowed by their daughter and son-in-law, Drs. Jennifer S. and Omar Hernandez, the Dr. Russ and Susan Schultz Scholarship in Music will benefit students in the Mary Morgan Moore Department of Music. 91.3 KVLU Public Radio will broadcast a live concert featuring the Faculty Brass Quintet and Houston-based Omni Brass at 7:30 p.m., Tuesday, Oct. 27, 2015. The broadcast is part of an on-going series Live from the Rothwell, featured on KVLU. The Halloween Spectacular concert will be held in the Rothwell Recital Hall and will be broadcast live to the Southeast Texas listening audience. The fun and energetic concert will feature traditional works and some "spooky" Halloween-themed pieces performed separately by each ensemble, concluding with a large brass ensemble piece. Bryan Proksch, assistant professor of music literature and musicology, examines both the decline and the subsequent resurgence of Haydn's reputation in an effort to better understand the forces that shape critical reception on a broad scale in his new book. 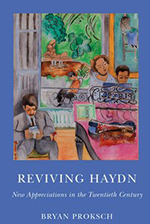 Reviving Haydn: New Appreciations in the Twentieth Century was published Oct. 1 2015 by the University of Rochester Press. The Cardinal Jazz Orchestra’s fall concert will put a fresh spin on the music of jazz legends Duke Ellington, George Gershwin, Herbie Hancock and more on Thursday, Oct. 8. The free concert begins at 7:30 p.m. in the Rothwell Recital Hall on the campus of Lamar University. The Showcase of Southeast Texas was recently profiled for its growth under director Eric Shannon. 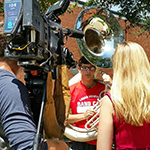 KFDM news interviewed Dr. Shannon, head drum major Adrian Woodard and freshman Holden Lewis, pictured.
" 'I've been marching since a freshman in high school,' said Lewis, 'and it's just been great. I had to stick with it.' Lewis says the band helped attract him to Lamar. It's his passion and he's happy to be a part of it." Assistant Professor of Trombone Tim Dueppen recently returned from a North American summer tour with the Alias Brass Company. Stops included Denver, Calgary, Banff, and more. Alias played countless shows, gave playing advice to young brass players, and performed alongside some of the finest brass musicians in the world. In addition, Alias has begun work on new aspects of their ever changing and dynamic stage show. Their upcoming season will bring a tour of Houston, California, Kansas City, and many more locations. The Cardinal Jazz Orchestra will hold auditions during Spirit Week, Aug. 17–21, 2015. You do not need to be a music major to participate. The audition will consist of two major scales, both prepared pieces (found on the CJO webpage), an optional jazz-oriented selection of your choice and a short sight-reading sample. If you are interested but not sure if you’re ready for the audition, there will be opportunities for anyone on any instrument. Depending on response, we will plan a second band, combos, rhythm section class, improvisation class, and more. If you have questions, please contact Rick Condit, director of the Cardinal Jazz Orchestra at rcondit@lamar.edu. Bryan Proksch, assistant professor of music literature and musicology, was initiated by the Lake Charles Alumnae Chapter of the Sigma Alpha Iota International Music Fraternity as a National Arts Associate in April 2015. The honorary membership recognizes a person for their distinguished contributions in support of the musical arts. Lamar University will present an exhibition of student brass players on Tuesday, April 21, at 7:30 p.m. in the Rothwell Recital Hall. The performance will showcase brass ensembles from the Mary Morgan Moore Department of Music, including trumpets, French horns, and trombones, as well as a combined brass choir. The concert will feature diverse styles of music such as classical, sacred, folk, pop and more. Voice students from the Mary Morgan Moore Department of Music earned numerous award placements at the annual Greater Houston Chapter of the National Association of Teachers of Singing classical auditions on March 28, 2015, at the University of Houston. LU Opera Theatre performs Bernstein's "Trouble in Tahiti"
91.3 KVLU Public Radio broadcasted a live chamber concert with Lamar University’s Clarinet Quartet and Clarinet Choir on Wednesday, April 8. The concert was the first in the new series "Live from the Rothwell." The Lamar University Faculty Brass Quintet held an exciting, interactive concert with music from the Baroque era through today, including selections from Bach, Handel, Shostakovich, Ellington, Gershwin and more. Lamar University’s Wind Ensemble was honored with an invitation to perform before the Texas Music Educators Association's 2015 convention in San Antonio. They presented a local preview of their TMEA performance at 7:30 p.m., Feb. 5, in the Julie Rogers Theatre. The ensemble performed selections from Percy Grainger, Samuel Hazo, Henry Fillmore and others. Lamar University Opera Theatre performed opera scenes featuring works by American composers Leonard Bernstein, Gian Carlo Menotti, Stephen Sondheim, Aaron Copland and Samuel Barber Nov. 21 - 23 in the Rothwell Recital Hall. Dr. James M. "Jimmy" Simmons, president emeritus, will teach two sections of Jazz Improvisation. MUSI 4300.01, Jazz Improvisation I, for those who did not take the course in Spring, 2014, and MUSI 4300.02, Jazz Improvisation II, for those who took the course in Spring, 2014, and wish to continue. The class will meet usually an hour on Tuesday or Wednesday, plus "field trips" for experience in local jazz venues. Dr. Bryan Proksch, assistant professor, will offer MUSI 1310, "History of Rock and Roll." The class will meet Tuesday and Thursday 12:45-2:05. This course is a survey of Rock Music covering the history of the musicians involved, the style and its development from the 1950s to the present. Topics to be covered include Elvis, The Beatles, Heavy Metal, and even Disco. The course is geared towards students interested in music generally and does not require or expect any prior musical training. The Lamar University Wind Ensemble has been honored with an elite invitation to perform before the Texas Music Educators Association's 2015 Clinic and Convention in February. In April, the Mary Morgan Moore Department of Music held it's second annual old-fashioned Concert in the Park with food, games and prizes on the Plummer Building grounds. Boundless energy and enthusiasm for his craft helped Connor Bordelon-Ross secure the highly competitive Clara Freshour Nelson Music Scholarship administered by the Texas Association of Music Schools. Industrial Carillon, Lamar University’s new music ensemble, proudly featured special-guest composer and Grammy Award-winner, Chen Yi, in their March 2014 concert. Yi was proclaimed by The New York Times as “one of the most distinctive composers of her generation.” Her compositions blend Chinese and Western traditions, transcending cultural and musical boundaries. Through doing so, Yi serves as an ambassador to the arts, creating music that reaches a wide range of audiences. A fellow in the American Academy of Arts and Sciences, Yi has inspired people with different cultural backgrounds throughout the world.